Food and Writing, Writing and Food. Yeah, that’s the call from Kim Nelson at Poets United. It inspired both the pictamy® and the poem. Food and writing are an inseparable combination… unless you prefer Drinking and Writing, but than try reading what you wrote the next morning, much less tracking down all the cocktail napkins. You know who you are, ha ha. You’ve said it right Amy! All told a companion on those solitary appearances, alone in a coffee-house. The little wisps of steam perfectly depicted in your sketch born of lots of inspiration.Perfect Ma’am, simple of sketch but grand of ideas and presentation! Great! Try Madison, WI. We were indoors a month ago! Ha. I am so old, coffee tries, but cant do the job all on its own any more. It needs to call in the Heavy Lifters – the doughnut brigade 🙂 Cackle. 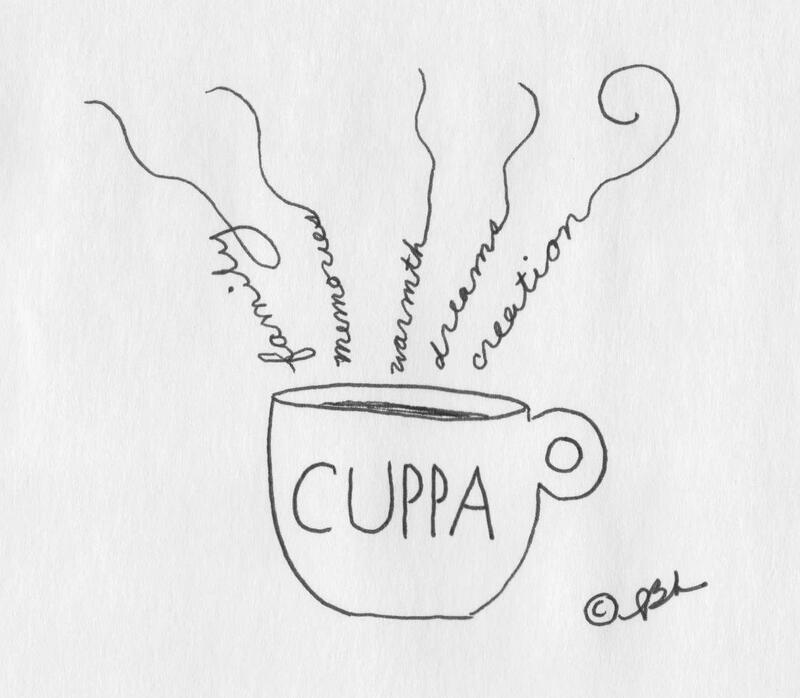 fun poem and drawing, but in my case it would be tea! There is truth here. I like this one. stinky college student…ha…luckily the smell of coffee drowns much out..i am an addict…i like my coffee..i like it black…i actually like the taste…smiles…. Why are college students stinky? My co-conspirator would be a mug of tea. Love the play on aMusement. Ah, I love my cuppa….so there’s a lot to agree with. Awesome! Made me smile, Amy. Years ago I sat in a nearby coffee shop on a regular basis. It was blissful. You’ve inspired me to find a new haunt near my new house.